INTERNATIONAL AWARD-WINNING CHILDREN'S SERIES! Winner of the Children's Literary Classics Award for Best Picture Book Series, The I Feel… Children’s Series continues to be celebrated by children’s therapists, speech pathologists, psychologists, teachers, parents and more! The series provides meaningful exploration of our dynamic emotional range in various contexts. Not to mention they’re fun, witty, and engaging! Check out the entire series! “Engaging, creative, an absolute perfect resource!” I FEEL... TOO! Did you ever notice the more you make others feel good, the better you feel yourself? This play on the original I Feel… book helps kids understand the importance of taking time to compliment others and the personal reward for doing so. The more you put into it, the more you get out of it. Finally I get this ebook, thanks for all these I Feel…Too! I can get now! 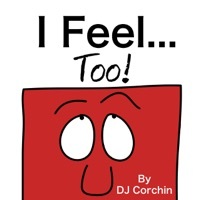 I Feel…Too! was the best books I ever buy. I Feel…Too! did exactly what you said it does. I will recommend you to my colleagues. I Feel…Too! is the most valuable books we have EVER purchased. I'd be lost without this. I am completely blown away.